As you may have heard, I participated in a cooking contest for multicultural families, sponsored by CJ Foods. They had four groups of 12 competing for finalist spots in the preliminaries. I made it to the finals and ended up taking home the 2nd place prize and W1,000,000. The theme was to make a food that could globalize gochujang, Korea’s famous red pepper paste. I have watched a lot of Iron Chef, Top Chef and Hell’s Kitchen and have always played couch chef, saying what I would have done differently. This was my chance to finally enter a cooking contest and see if I was all talk. One of the rules I’ve learned from those shows is to cook what you know. If I know how to cook any food, it’s Tex-Mex. My first job in a professional kitchen was at a Tex-Mex restaurant. And I’ve been making Ko-Mexican food since my first few months in Korea back in 2004. So something along those lines was logical. But how to incorporate gochujang? When I visited my brother Ben’s restaurant in 2008, he had some cool sauces he made up. One of my faves was a roasted red pepper aioli. So, make a gochujang aioli. Is there anything else in my spice drawer that can kick it up a notch? Oh, yeah! Spanish smoked paprika. Ben gave this to me as a present, a whole industrial sized bag of it. I’ve enjoyed it sprinkled in my kimchi jjigae. I tested this out in the kitchen, making the aioli from scratch. Tasted it, and it worked. Wow! So, let’s make Bulgogi Quesadillas with a Smoky Gochujang Aioli. Didn’t feel complete and balanced, though. It needed something bright and fresh. Staying with Korean flavors, I experimented with making a Korean pear salsa. And I threw in the idea of adding goat cheese as a curve ball, but I later decided against it. I tested my experiments at the Nanoomi party a few weeks ago. It was a hit. A couple of weeks passed, and it was the day of the competition. EJ couldn’t go with me because of doctor’s orders. Got up early and headed to the COEX exhibition area. The ticket people had no idea what I was talking about regarding the cooking contest, despite it being advertised on a large banner in front of them, but the guard knew about it and let me in. The cooking contest area was right by the entrance, and they promptly dressed me in chef’s whites with a coffee filter. Cooking wouldn’t start for a while. I used the time to make sure they had gotten all the ingredients I listed. A few were missing, but they rounded those up for me. Korean power blogger Jo Hyo-ryeon of Natural Kitchen was my sous chef. She was amazing. Her knife skills humbled me. And she was my second opinion when tasting. After loads and loads of speeches and cheesy photo ops (“Fighting!”), we got to cooking. I was one of only three men in the entire 48 competing. Both of them were in this group. One was from China, and the other was from Pakistan. I hung out a bit with the Pakistani guy, since we both spoke English. And I was excited that he was attempting a lamb curry with gochujang. I don’t know about the other groups, but this one was quite diverse. Other than China and Pakistan, Vietnam, Russia, Japan and Uzbekistan were represented. They came up with some great food that I’d like to try at home some time. 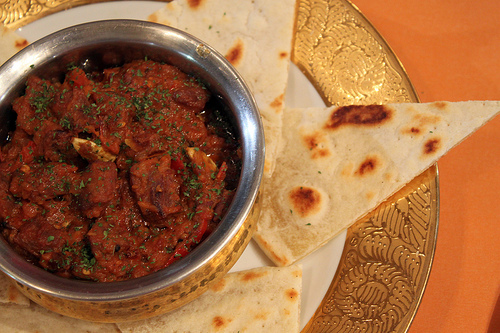 Check out that lamb curry. He made his own bread for this. And it was good. I was surprised it didn’t place. Other people loved it. The Uzbek lady across from me made her own dough and created these tortellini-shaped beef dumplings with a gochujang sauce. This was also a hit with the crowd that didn’t place. This one made it to the finals, though. Vietnamese spring rolls. This one did too. This was done by the Chinese male contestant, but I never got the name of the dish. Mmm! Stuffed peppers! Feeling homesick. This one was a forehead slapper. Of course! Golubsky (Stuffed Cabbage Rolls) using kimchi in place of cabbage. Again, don’t know what it was, but it looks like it would go good with some mashed potatoes. Looks like a type of chicken stew or Dalk Doritang. This smelled scrumptious! It was made by the chef next to me, and I would go to wash stuff in my sink just so I could be near and smell her food. This was mine–after the judges had taken a sample. I’ll post the recipe soon. I made a lot of extra quesadillas, anticipating mistakes. And I plated them for the crowd. Both Thursday and Saturday, the extras got cleaned out by everyone. What’s funny is that I still haven’t eaten one myself. I know how the elements taste individually, but I never got to eat one of my completed dishes. Congrats on winning and I really am impressed by your ability to place so high without tasting your final product yourself. That takes a lot of skill! I will be looking for many more of your recipes.